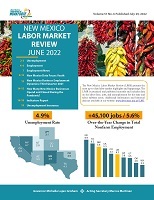 The New Mexico Labor Market Review is a monthly publication from the New Mexico Department of Workforce Solutions, Economic Research & Analysis Bureau. Publications are available back to 2003. Files are in "pdf" format. For a listing of special articles from each volume, visit https://www.dws.state.nm.us/Labor-Market-Information/Publications/Labor-Market-Review.